When the Mosaic Association South Africa (MASA) selected the Little Fighters Cancer Trust as the recipient of their annual national community service project – “Butterflies for Kids with Cancer” I don’t think that either they or the Little Fighters Cancer Trust ever thought that the response would be SO fantastic. MASA members joined in with glee, getting their friends, family, mosaic classes and even schools involved in the project, and we even had people from South Africa and from overseas who had no connection with MASA or LFCT asking to join in… and they did… we received butterflies from as far-afield as New Zealand and Australia and also some from our neighbouring countries. By the end of September we were able to finalise the numbers and are overwhelmed and stunned to be able to confirm that in excess of 500 beautiful and colourful butterflies of various shapes and sizes were donated to make our Paediatric Onco wards a bit happier and friendlier for our Little Fighters. Hospital wards are not nice places; they are dreary and cold and yucky, and we know that these beautiful butterflies will put smiles on the faces of all our Little Fighters and all the other Children with Cancer who spend so much time in hospital. Many of the Butterflies have their own little stories attached, and many were created in memory of someone’s loved one who lost either their Fight, or who is still Fighting Cancer. Notably, the majority of these wonderful creations were made by children and we love that! Each butterfly was also accompanied by a small donation from the artist and total donations amounted to just over R16 500!! Butterflies bound for Unitas Hospital Trix van den Berg, Cher Manning, Nelie du Toit and Sylvia Bouwer responsible for mounting the group. 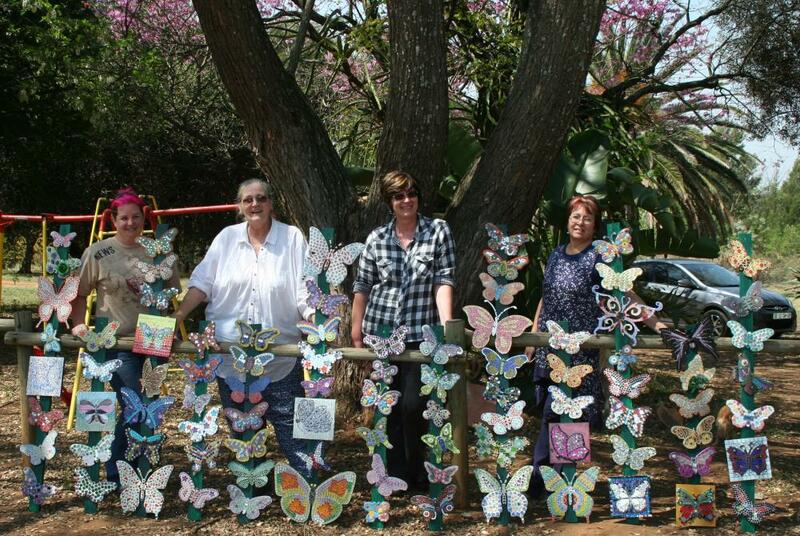 Late in September, 89 butterflies mounted on 13 wood strips were delivered to the Pediatric Oncology Ward of the Unitas Hospital in Centurion (Pretoria). The installation of the rest of the butterflies is still ongoing, albeit a bit slowly, but making arrangements with the hospitals is a bit of a red-tap quagmire. Many more butterflies will still be installed in the Paediatric Oncology Wards in hospitals in East London, Cape Town, Pietermaritzburg, Durban and Johannesburg. We will bring you updates when these installations have taken place. The Little Fighters Cancer Trust would once again like to express our sincere thanks to MASA for selecting us as the 2015 Beneficiary and to each and every person who gave up their money, time and passion to create these beautiful creatures.